Beautiful 4 bedroom home with granite counter tops, stainless steel appliances and all upgraded furniture. This home is a very short distance from the clubhouse and backs onto a lake so you can chill out observing some of our native bird life going about its daily business. 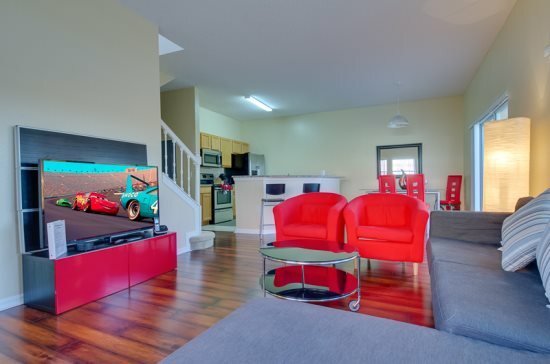 The main living area of the home has attractive wood flooring, comfortable seating and a large flat screen TV with DVD player. 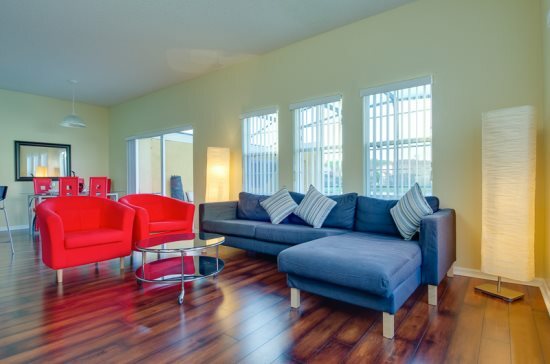 The property also has the benefit of free Wi Fi access for the enjoyment of our guests. The dining area is adjacent to the kitchen and enjoys a view through the sliding patio doors of the private pool area and pond beyond. 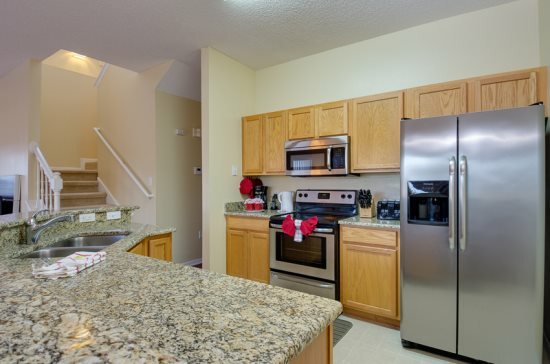 The kitchen is fully equipped for guests to prepare full family meals and snacks. Stainless steel appliances, Fridge /freezer, microwave, full size stove and oven, waste disposal, dishwasher, an array of other electrical appliances, coffee maker, toaster etc. All pots pans, crockery, glassware, plates etc are alo supplied. 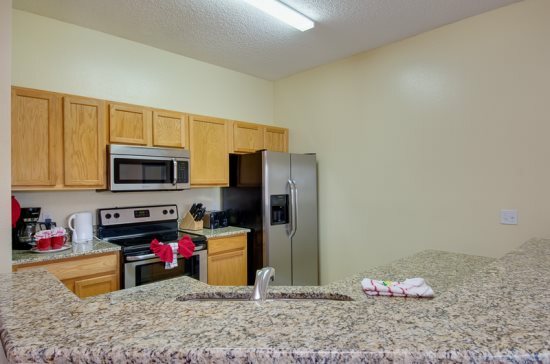 A full size washer and dryer as well as iron and ironing board can also be found in the property. 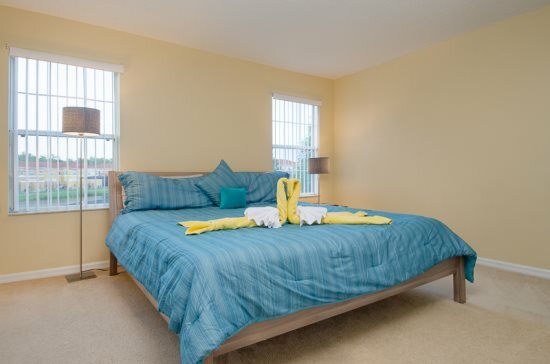 The downstairs guest bedroom has a Queen size bed, built in closet space, flat screen TV. 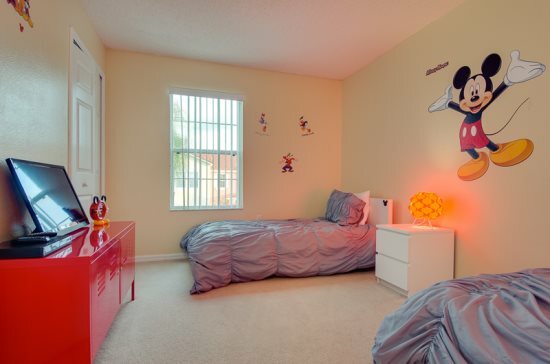 Next to this bedroom is one of the homes family bathrooms which has a bath with shower, sink and toilet. Moving upstairs the Master bedroom can be found. 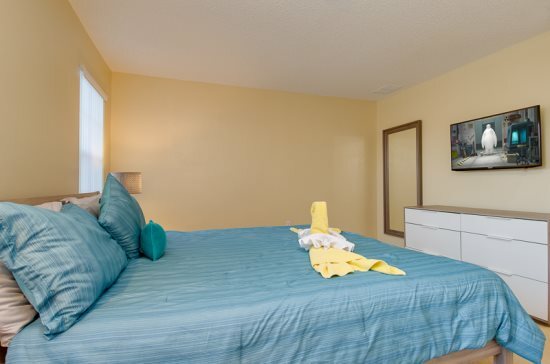 This room has a King size bed, 40 inch flat screen TV, dresser and walk in closet. 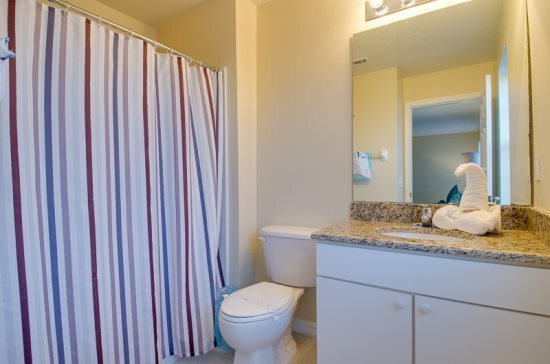 The private en suite master bathroom has A large walk in shower, sink and toilet. 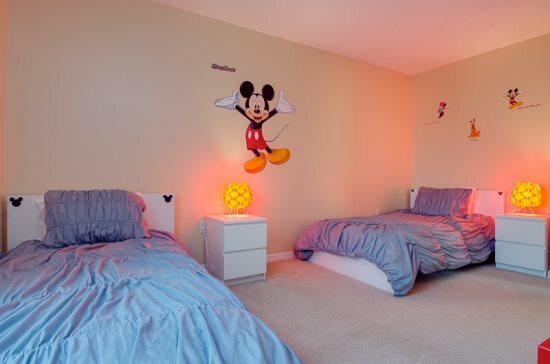 Bedroom # 3 has a Queen size bed and built in closet and bedroom # 4 has 2 twin (single) beds) built in closet, flat screen TV and DVD player. 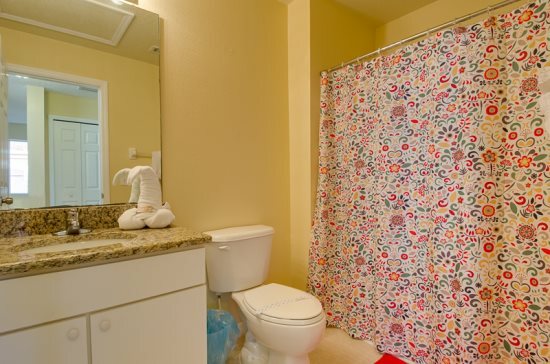 The third family bathroom is also on this level and has a bath with shower, sink and toilet. 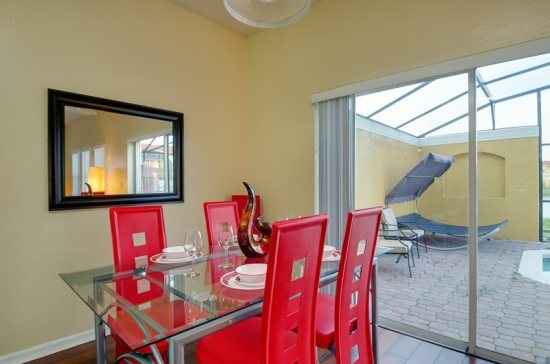 Moving back downstairs to your own private outside space you can enjoy your own private pool and sun bathing area which is fully screened in to help keep out bugs but still let the Florida sun shine through! 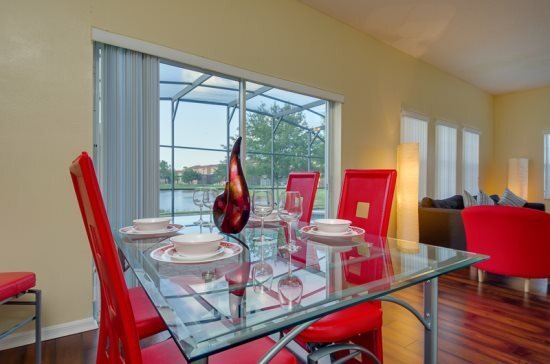 The area overlooks the pond and is just a very short walk to the community clubhouse. Guests please note that this property does not have a pool heater. May - Oct pool temperatures are usually fine without supplemental heating. The community pool nearby is a heated pool during the cooler seasons. 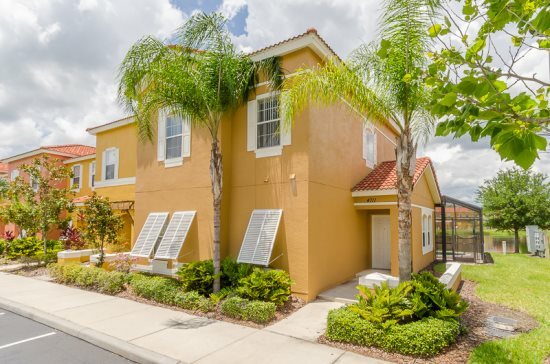 Terra Verde Resort has become one of the most sought after gated communities in Orlando. Built with a Mediterranean theme, and surrounded by lush tropical landscape, it is just a two minute walk to the Clubhouse, where you can mingle with the other guests and enjoy many top of the range features and amenities. These include, cyber café with wireless internet access, sauna, spa, fitness centre, basketball and tennis courts, beach volleyball court, billiards room, children’s sandy play area and climbing rock, arcade video games, big screen TV, stocked fishing lake, large heated resort size swimming pool with poolside Tiki Bar, snack and beverage service, hot tub, concierge and 24 hour security. 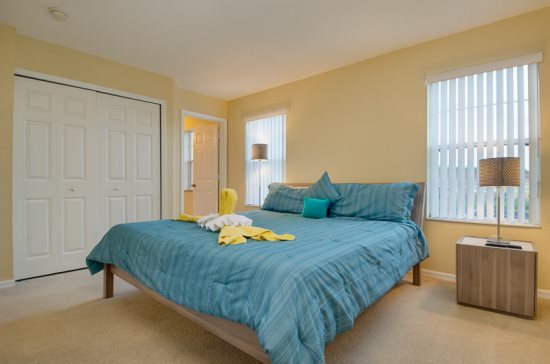 Terra Verde is on Poinciana Boulevard, close to 192 and just minutes away from Disney World, Universal, and Sea World. There are numerous places to eat close by as well as clothing outlets, shops, supermarkets and two fantastic malls about a 30 minute drive away.